You can make a mill by placing three pieces of your own color in a row along a vertical or horizontal straight line (three pieces along a diagonal line does not count as a mill). Block all of your opponent's pieces so your opponent cannot move. 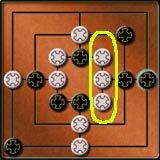 The game is automatically drawn, if the number of pieces does not change for 50 - 2x25 – moves. When a player makes a mill, that player can remove any opponent's piece that is not in a mill (if every piece is in a mill, then any of them can be removed). The player to go first is randomly selected. To start the game, tap an empty spot to place one of your pieces on the board. With each turn, try to make a mill (three of your pieces in a row, vertically or horizontally) or block your opponent from making a mill. Each time you make a mill, you can capture one of your opponent's pieces. Tap the piece you want to capture. You can only capture pieces not in a mill. The placing phase lasts until both players have placed all nine of their pieces on the board. A piece cannot be moved until all nine pieces have been placed. After all nine pieces have been placed on the board, you must move one of your pieces to an empty adjacent spot. Try to make a mill and/or prevent your opponent from moving pieces. When a player is reduced to three pieces, that player can 'jump' a piece to any open spot on the board. Common Nine men's Morris as described above (this is the default setting). There are 10 pieces for each player, which can be moved right from the start. 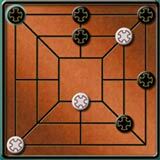 There are 12 pieces for each player, and diagonals are added to the board. You can change your preferred variant in the "Chat and game settings" dialog of the game.